The very talented Tim Jones has recently published a new novella and kindly agreed to a blog interview. Congratulations on your new novella, ‘Landfall’. I can’t help noticing it bears the same name as a certain NZ literary journal. Is there a connection? Connection, guv? That was right out – I deny that completely! … which is a not an attitude that finds much favour in the world of my novella. Sounds intriguing! What defines something as a novella? So, in Hugo Awards terms (a boy can dream!) 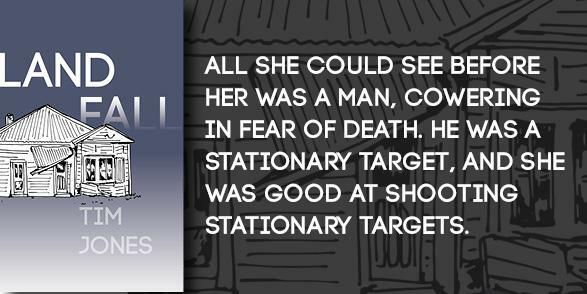 “Landfall”, which comes in at a tick under 11,000 words, is actually a novelette – happily, however, it met the requirements that Paper Road Press was looking for when it called for novella submissions. In less mathematical terms, I think of a novella as a novel on a restricted diet, rather than as a longer short story. Novellas are like novels boiled down to the main plot and a few central characters. In my case, there are two main characters and for the most part the action is confined to the same location over a short span of time. How is writing a novella different from writing a short story or a novel? Although, having said that, the seeds of this novella were in a short story called “Pilot” that I’d had several cracks at writing over the years without success – I had three different partially completed drafts lying around. Each of these was from the point of view of a single character, Nasimul Rahman. When Paper Road Press called the first round of submissions for their Shortcuts series of novellas, I had the idea of adding Donna, the second viewpoint character, and alternating their viewpoints throughout the novella – and that’s what made the narrative work. I believe it’s going to appear in print soon, too. Who else will be in the print publication? 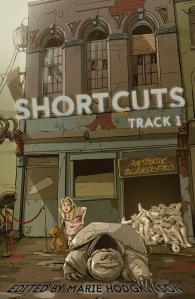 I understand there’s a second Shortcuts series forthcoming from Paper Road Press, too. They are a very active Wellington-based publisher putting out some great work. To start with, it will be available through online sites (such as the Paper Road Press website, Amazon, Fishpond, and Book Depository). What’s next? Will there be more novellas? I like writing at novella length because it allows for more complexity than a short story – and because, as quite a slow writer, novellas don’t take me the agonising amounts of time that novels do! So, while I’m currently trying to finish a poetry collection, I do intend to write more novellas. I already have one unpublished novella, but it’s an the unusual niche of “(association) football romance”, a market segment to which the publishing industry hasn’t yet turned its full attention. If anyone hears about publishers looking for Mills and Boon of the Rovers, please let me know. Thanks Tim! Best wishes for your writing! 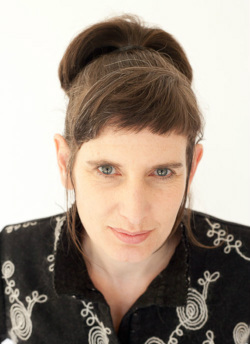 This week, I interview Maria McMillan, whose poetry collection The Rope Walk was recently published by Wellington publisher Seraph Press. Congratulations on your first book, and such a fine book. How did you get started on this project? What sparked it off? I had to write two poems for a writing workshop, and without meaning to, produced two linked persona poems. One from the perspective of a 19th century man experiencing his last days in his home country of Scotland before emigrating to New Zealand. And one from the perspective of his wife on the death of their young son on the ship coming over. I found making stuff up in these poems liberating. It let me write a sort of truth that I couldn’t reach when I was strictly observant of or trying to record real experiences. I made a leap then from documentary poet to maybe a drama poet. There was something new for me as well in using a voice from a different century. I became fascinated with the notion of a stoic people, like the Scots are perceived to be, experiencing huge emotional and physical moments. If your culture is taciturn and unfussy how do you talk about leaving the place your ancestors are buried knowing you won’t ever come back, or about losing a child? How do you make small words carry big moments? So I had these two linked poems, and they got a good reception in class and from my teacher so I started writing more from different generations of the same family. I think the poems are ambiguous and can be read in different ways but for me I know who is the narrator of each poem and how they are related to the other narrators. I know the back story. I thought a lot about loss when I was writing them, and I wrote them among writing other poems over nine years, so way after that course had finished. I thought about the loss of a homeland when you leave it, the loss of men not coming back from war, and men losing their jobs and sometimes their sanity and their sobriety in the 1980s, and waves of young people killing themselves. I also think about the loss – I’m not sure what it’s a loss of – when you grow up female and all the exhilaration of becoming a woman, and how that’s tempered by a sudden realisation that there’s some danger in being female, and you and your friends are in a vulnerable position. What do you do with all that? How do people cope with all these different sorts of grief? You’ve chosen to write about a fictional family. Why not a real one? Will we hear more about Megan, Margaret & the others? In that first poem, I actually spent hours trying to find this photocopied transcript of this amazing diary of my ancestor who left Scotland for New Zealand, a first hand account of farmers forced off their traditional land, an account of his last days before getting on the ship, then the journey itself and arriving here. It was riveting stuff. I couldn’t find the diary and the poem was due so I started doing it from memory and then I just made stuff up. It was great for me, because I always had a nagging concern about whether that ancestor’s story was really mine to tell. Did I need permission to tell it? Who from? Also, when I got rid of the idea that I had to be accurate I could say what I wanted. I could have the characters move and speak and think the way I wanted them to. I had perfect knowledge of them because they were mine. It was much easier than having to research minutiae to figure out motivations, or possible scenarios. As to reappearance of the characters – no, I think I’m done with them. It could have kept going, but I needed to stop and do something else. The book is beautiful as an object as well as having beautiful contents. How did the cover image come about? Why did you choose a ship? I had always imagined that the cover would just have text on it. I love really good typographical design. My partner, Joe Buchanan, is a typographer and he’d agreed to do the cover, but he decided it really needed an image to work. Apparently the letters in my name didn’t look right. I said okay, but it has to be a 19th century circus trapeze artist mid-leap, or a ship. Joe’s quite ocean-focused and went with the ship. He drew an image based on the ‘Adamant’, the name of one of my poems, as well as a real immigrant three-masted barque. Then he did a linocut of it. He printed it all, including using a die-cut for the circle, on his 5″ x 8″ Adana platen press. I was really lucky to have so much input into the cover but it was Helen Rickerby, who runs Seraph Press, which published the book, and Joe who made really good final decisions about how it could all work and look as beautiful as it does. How do you make time for writing? Is there a particular time of day you prefer? A place you like to go to? I work four days a week, sometimes five. Joe and I have two small children. Usually it’s night that I write because that’s the only child-free time I have but sometimes I shut the door of the bedroom in the weekend. I’m not a cafe writer. I need to be alone, and there needs to be no music or talking. I think it’s because poetry is so much about the sounds of the words. Even when it’s for paper and not performance, it’s all about the sounds. I usually write a first draft in one sitting, and I do a lot of reading out what I’ve just written. I think my writing ear needs quiet. Those non-disturbed moments are rare, and it’s frustrating when nothing comes of it. Often the case. You belong to a writing group. How does that affect your poetry? My writing group is fabulous. We’re all poets. We used to meet in person, but now we do group video chats which has meant we meet more frequently and it’s sort of a routine low key thing we can do in our dressing gowns if we want. Having a dedicated audience willing to talk about your stuff in detail is a luxury. Our rule is the poet reads their poem and then shuts up while everyone talks about it. We’re quite strict about that and are very stern when the poet tries to interject and explain something in their poem. I learn a lot every time, whether it’s my poem or someone else’s being discussed. They’re all smart, and great readers and writers. It’s like two hours of full immersion, so you’re bound to end up a bit more fluent in understanding what does and doesn’t work in poetry. It’s been good as well, in that when I’ve run out of steam submitting to despondent journals, I’ve been pretty relaxed about it, because my measure of success has been whether my writing group likes something or not rather than if it’s been accepted somewhere. The other good thing (I’m quite fond of this group as you can tell) is that I see my friends and peers write astonishing poetry. It’s not some big anonymous overseas genius, it’s my mate producing a small miracle of words. There’s a sort of awe in there but also it makes it achievable. And, as well as celebrating with them, when they produce a winner, a sort of fierce determination in wanting to match them is born. Like that is it? Right then. So it’s motivating because you don’t want to be left behind. You have another book forthcoming from VUP. Can you say a bit more about that? Tree Space will come out in 2014. It’s a different beast to The Rope Walk. There is a bit of sea in there though, and some boats and toxic algae and stuff. But there’s also hitchhiking and protest marches, and road trips to Waitara and climbing mountains. There’s a Polish cabin attendant too. A lot of moving from one place to another. Lots of science. As well as being a typographer, Joe studies the evolution of species. When he told me that he was hanging out in this thing called Tree Space, essentially a virtual endless mathematical terrain which represents all possible ways in which species might relate to one another, I had to write a poem about it. Phylogeneticists use algorithms in tree space to figure out how species probably evolved. They have all this language around Most Likely Trees and Branch Swapping, bushy and stark trees. It seems wonderful that figuring out the very basis of life happens like this now. 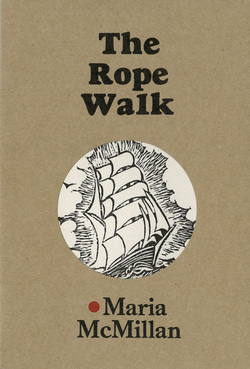 Maria McMillan has been writing poetry for many years, and The Rope Walk is her much-anticipated first collection. Maria has studied politics, trained as a librarian and has a long history as an activist. Originally from Christchurch, she now lives in Wellington with her partner and daughters. She blogs at http://mariamcmillan.weebly.com. the safety pins from dry cleaning? a stout chrome pin, or dainty gold? you rescue, the family pet or your computer? have you turned the wrong way? when you imitate someone else? that have lost their appliances? Have you ever tossed an orphaned cord? when old bottles surface in a garden? Today’s Tuesday Poem is by Mary Macpherson, a Wellington photographer, poet and communications professional. 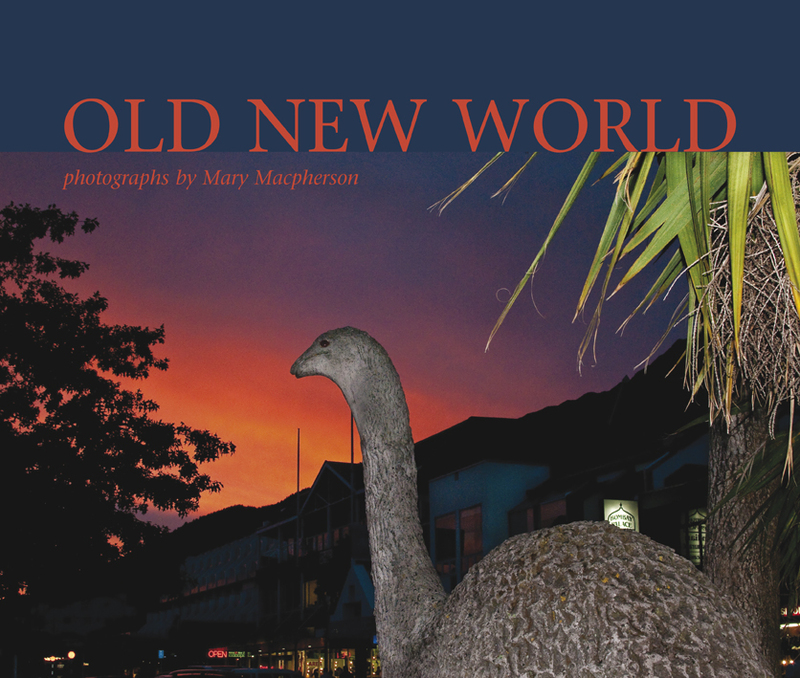 Mary has just released a stunning new book of photographs, called “Old New World” (Lopdell House Gallery, 2012), which explores the changing face of small town New Zealand. Inside, you’ll find a town clock, a painted tiger, war memorials and an old telephone box, alongside motel chalets and beach subdivisions. As well as posting Mary’s poem, Litter, which was recently published in Hue and Cry, I am very pleased to be interviewing Mary about her book. Congratulations on making such a beautiful work of art. 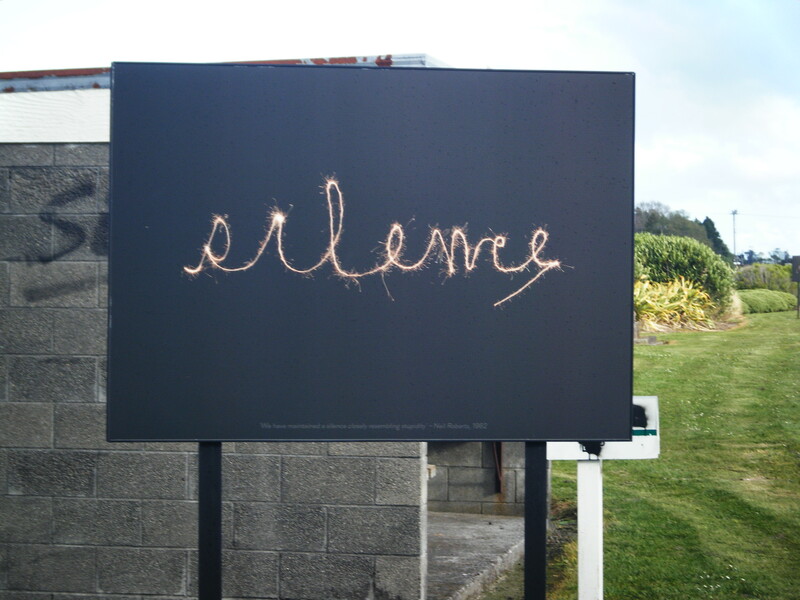 You’ve had many exhibitions over the years – I remember seeing your “Signs of Texas” exhibition at the Mary Newton Gallery in Wellington, as well as a series involving plastic sharks and lace fabric, and another series of vividly abundant patches of wild flowers and weeds that featured in Landfall. Is “Old New World” a departure from your previous work? The At Sea series, which featured the shark and lace, were scenarios that I constructed and photographed. That’s a different approach to the documentary style that I used to express the ideas of Old New World. But all the work I do, whether it’s of constructed images or the ‘real’ world, is exploring ideas and concepts. Old New World, relates most directly to a series called Urban Landscapes which was exhibited in at City Gallery Wellington in 1987 and again in 2006 with the Signs of Texas work at the Mary Newton Gallery. In Urban Landscapes I was excited about photographing everyday reality with formal precision, to bring out the beauty and strangeness of the vernacular. (A few images from this series are in the BNZ and Te Papa collections). Old New World is probably a deeper work where I’m exploring a piece of social change that happened during my lifetime, and looking at the way New Zealand is shaping and representing itself. Did you set out with a theme in mind that you wanted to explore, or did the theme(s) emerge as the book progressed? The work began in an organic exploratory way. Because of my childhood and teenage holidays in a small Maniototo town in the 50s and 60s, I have a particular memory of the way small towns were in that era, and the society of the time. I also have strong visual and physical memories of the intimate human scale underneath a huge blue sky. A few years ago I noticed the small places in the Wairarapa were changing – becoming much more branded and conscious of themselves as destinations. Because it affected some sense of myself (childhood memories are particularly potent), I picked up my camera and started photographing in the main streets and back streets. Having done one place, I thought I should check the next place up the line, and the next…. Because I was really interested in the images that were coming back, I decided to do a substantial body of work that covered representative places all over New Zealand. I thought a lot about how to represent the places I was photographing. I was never going to have intimate knowledge of the hundreds of places I visited, but what I could do was to portray the main trends and possible futures of small towns that I saw. I see the book as an overall fictional small town made up these multiple narratives. I also become very interested in the way these places were representing themselves and New Zealand history – in murals, advertisements, statues and artworks. I wanted to record these and show how they related to their surroundings. Old New World” could be viewed as a road trip collection. Does it represent several long summers on the road? The work was made over seven years, whenever I had time and money to be on the road – not necessarily in the summer. In between times I printed and edited work, and thought about what I was doing. Small town New Zealand and rural New Zealand both feature strongly in this collection – the Bay of Plenty town of Te Teko, Balfour in Southland – what attracts you to out-of-the-way places? I went to places that were slightly below the radar, rather than places that were officially sanctioned as cute, or eccentric. I didn’t want to make a clichéd or stereotyped view of New Zealand. I hoped the view that emerged would be of someone who was visitor to a place, looking intently, and bringing back things that were of this country, without it being forced. Later in the work I went to places that have been changed by extreme development or prosperity, like Queenstown or Mount Maunganui. By then I was ready make photographs that incorporated this knowledge, but still had sincerity at their heart. Do you drive along until something catches your eye, or do you set out with an idea in mind? It was really a combination of those approaches. As the project progressed and I become more conscious of the direction I was heading, I did develop lists of things I wanted to include and went looking for them. But I had to be wary of that approach too. Trying to photograph (or write) with the rational ‘I should do this’ mind, can lead to over-determined and not very interesting results. So I also tried to stay open to just walking down the street and being struck by wonder at something – being drawn along by the content and language of what was happening around me. Some of the most interesting images were made this way. One of my (many) favourite photographs in the book is of “The Soap Factory – Home of Egmont Soaps” with its differently sized windows and carefully painted words in a range of typefaces. Do you have a personal favourite? For the project I took over 2,000 images and selected 62 of them for the book and 45 for the exhibition. So I guess I feel they’ve all passed the criteria for selection. Perhaps the best way to talk about it is in terms of the aesthetics and themes of the work. One thing I’ve always been interested in, in my photography is finding ways to get a sense of how people perceive their world. In Old New World this surfaces in the photographs I’ve made of statues, murals and public artworks – I was very interested in how people were representing regional and national history and regional identity. When photographing this type of iconography I wanted to place it in its surroundings – to show the ideal and how it sat in ‘real world’. 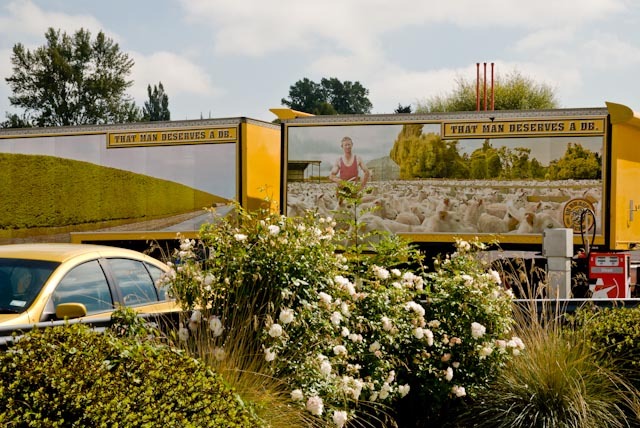 One photograph which is quite extreme is the image from a truck stop in Canterbury, where the DB advertisement featuring a pink-singleted shearer appears to have arranged reality around itself – to the point where every colour, and even the vegetation, matches the advertisement. The shearer (who looks strangely like Prince Charles) appears to be about to cut off the top of a real tree in front of him. I enjoy the complexity and strangeness of the image. (It’s also in the Te Papa collection). You’re also a poet – co-author of “Millionaire’s Shortbread” and author of “The Inland Eye”, Pemmican Press. Is there a relationship between your photography and your poetry, or are they two quite separate arts? I do practise them as separate streams of work and don’t put them together in a literal way. But I think that because photography and images are such a strong part of my life it seeps into some of my writing – I’ve written poems based on the box of slides my mother left our family, written about the complexity of light and quite a lot about journeys. If words enter the visual sphere, I like the visual to clearly be the driver and I still seem to like to work that stems from the pop culture era. I respond to an Ed Ruscha, Richard Prince type of sensibility. Lately I’ve been interested in a multi-media book of photographs, documents, postcards and signs, called Redheaded Peckerwood by Christian Patterson. It’s a creation that addresses a killing spree by two teenagers in the States in the 1950s. Where can people see your photographs and where can they buy a copy of the book? The photographs are currently showing at Lopdell House Gallery in Titirangi, Auckland, until 5 August. Lopdell House will then tour the work around regional art galleries. The book is available at independent bookshops nationally (e.g. Unity Books, the University stores, Wheelers, Page and Blackmore etc), and Paper Pluses in Hamilton and Porirua. On the web it can be ordered from Lopdell House Gallery http://www.lopdell.org.nz/ . I’m delighted to be interviewing poet, novelist and short story writer Tim Jones about his latest collection of poetry, Men Briefly Explained, as part of his virtual book tour. (And no, that’s not Tim pictured on the cover, but there is a photo of him at the bottom of this post.) It’s a very enjoyable book, which I’ve already read twice and intend to read again. 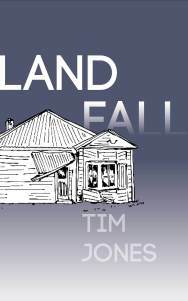 Tim’s previous publications include poetry collections Boat People and All Blacks’ Kitchen Gardens, short story collections Transported and Extreme Weather Events, and a novel, Anarya’s Secret. He is also co-editor of Voyagers: Science Fiction Poetry from New Zealand, which won “Best Collected Work” in the 2010 Sir Julius Vogel Awards, the same year he was awarded the NZSA Janet Frame Memorial Award for Literature. First of all, Tim, how did your recent “real-world” book tour go? Any particular highlights? The highlight of the whole tour was meeting up with friends – both people I already knew in person and enjoyed catching up with again, and people, especially poets, I knew only from the Internet before this.Of all the launch events, I think the Friday night event at the Rona Gallery in Eastbourne, which is part of Lower Hutt in local body terms but feels to me a lot like the seaside suburbs of Wellington, was my favourite. The staff are friendly and knowledgeable (plus there are two Tuesday Poets within their ranks! ), the venue is great: you walk into an excellent bookshop and, at a certain point, it morphs into an excellent gallery – what’s not to like? There was a good crowd who laughed at all my jokes (which is, of course, the true measure of success! ), books were bought and nibbles nibbled – it was a really good time.But another highlight (and it is so strange for me, an avowed South Islander, to be selecting only North Island highlights) was to read poetry for the first time in Auckland. I wasn’t at my best by by that stage, as I had picked up a cold, I was tired, and the rain was bucketing down, but I have always been nervous about reading in Auckland, and it felt good to break through that particular barrier. It was good of PoetryLive to let Keith Westwater, Dr David Reiterand I be part of their regular weekly readings series. How does this latest book fit into your body of work to date? Is it a departure from or a continuation of themes from your previous collections? There have been poems about men, masculinity and growing up male in each of my two previous collections, Boat People and All Blacks’ Kitchen Gardens. The difference this time is that, having initially put together a number of such poems as a chapbook (which I was going to called “Guy Thing” – I’m glad I changed the title! ), I then decided to go on and write more poems around these themes, rather than (as in my previous collections) having a collection with several sections, each devoted to a theme or style of poem. The other difference is that my two previous collections each had a section of science fiction and speculative poetry, whereas this one doesn’t – I guess only “As you know, Bob” and “In A World Without Pity, A Town Without Fear” would qualify as speculative poetry. I’ve just joined the Science Fiction Poetry Association, and even guest-edited an issue of their online magazine Eye To The Telescope this year, so I think this is a temporary aberration – perhaps not much science fiction is needed to explain men! I gather that these poems were written over a five-year period. Did your approach to writing poems about men change as you went along? As noted above, having initially discovered that I was writing a number of poems about men and planning to bring them together in a chapbook, I then decided to go for a collection. I don’t usually write with a theme in mind before I start – I usually write first, and look for themes later – so this took a bit of adjustment. Once I got underway on these poems, especially the ones about older men near the end of the book, though, I found that they came quite quickly and relatively easily. I think I might try writing more themed collections in future – in fact, I have a couple of possible themes in mind for future poetry collections, plus another chapbook idea. I like chapbooks a lot – I am determined to put one together at some point. You write award-winning fiction as well as poetry. Do you work on your various projects concurrently or sequentially? I find that I can’t work on a novel and short fiction at the same time, but I have at times been able to work on fiction and poetry at the same time – well, say, a morning on one and an afternoon on the other. I’m concentrating on short fiction at the moment – I went through a nervous time when there seemed to be a blockage between the short story ideas I had squirrelled away and my ability to turn them into stories, but I feel (I hope) as though the knack is beginning to return. the most attractive woman in the room. each wilder than the rest. What’s your own personal favourite? That’s a tough question, because it’s like being asked to choose between one’s children. Then again, I only have one child, so [puts names of poems on folded slips of paper in hat, swirls slips of paper around, without looking, pulls out a slip] … my favourite poem is “Thinning”! It’s kind of gloomy and I stopped reading it at readings because it was depressing everyone too much, but I’m particularly pleased with that one. 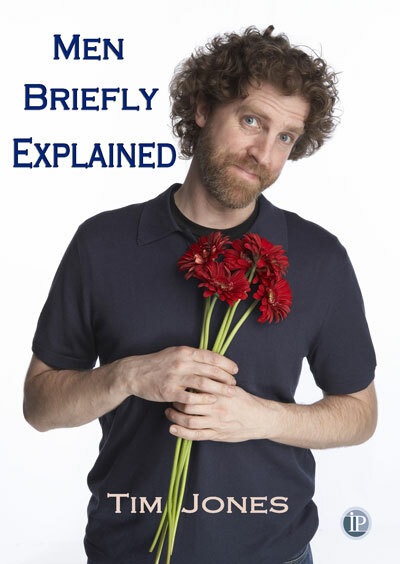 My favourite poem to read out loud is “Men Briefly Explained” itself – I’ve noticed that it’s mainly women who appreciate that one. Another collection of short stories, and again, I have a theme in mind as I write them. Right now, I have a couple of published but uncollected stories that fit with the theme, a couple more completed but unpublished stories, and a whole bunch of first drafts, bits of stories, and story ideas – which sometimes consist of no more than a title! So there is a lot to do yet, but I’m enjoying the process. Links to more interviews on Tim’s virtual book tour here. 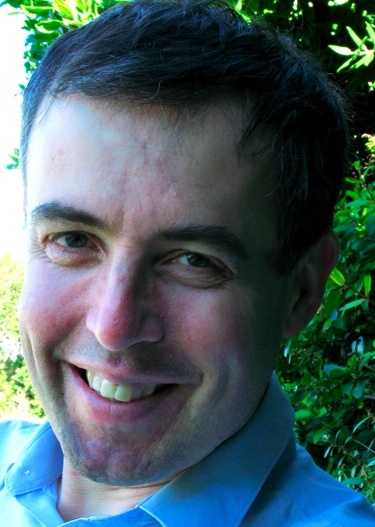 Mark Stephenson is a Wellington writer whose first novel No Second Chance has just been published by Steele Roberts. No Second Chance is the story of Anna, who arrives in Wellington in 1947 as a survivor of the holocaust. As well as being a story of survival, courage and betrayal, it’s also a story of love and hope. Anna forges a new life in a new place, but the past is always with her. 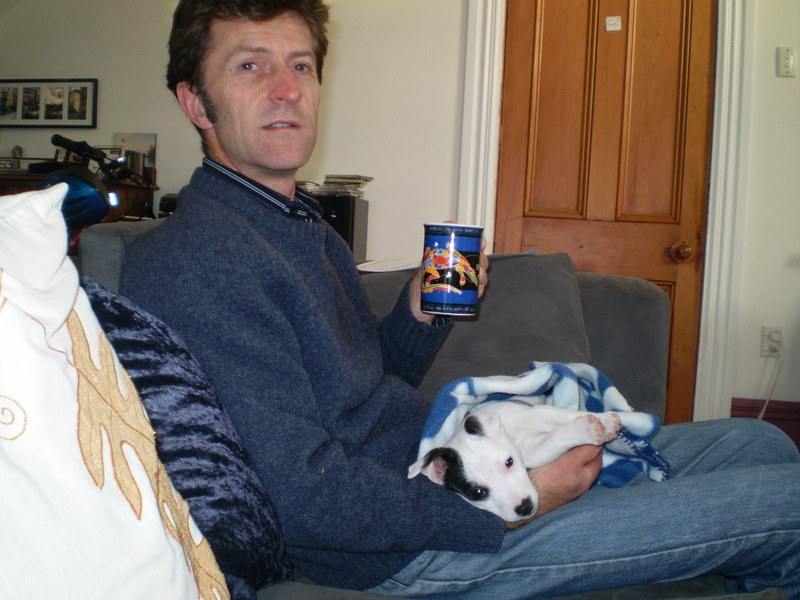 Mark grew up in the United Kingdom but moved to New Zealand in 1985 to work as a junior doctor in Invercargill. He has lived in Wellington since 1989 where he works as a GP and writes part time. He lives with his partner, a daughter and two dogs. Mark’s short stories have been published in JAAM, Takahe, New Idea, Viola Beadleton’s Compendium of Seriously Silly and Astoundingly Amazing Stories and Washington Square. Recently I interviewed Mark about his beautifully written new novel, and about writing generally. Mark, when I first met you, you were writing short stories. What led you to write a longer work? Yeah, this novel started life as a short story, which was published in Takahe way back yonks ago. For some reason I just kept thinking about the characters and the reasons behind their actions. I gradually filled in the details of their lives and fitted them into a historical context, which wasn’t there in the original story, or not so much of it. Then I started thinking about the next generation, and the next one after that, and the consequences for them as well. So it became a story of how historical events can break apart a life, and a family, and eventually how the characters might come back together again. What was different about writing a novel, compared to writing short stories? It took a lot longer…! But seriously, it’s easier in a way as long as you can stick to the task. You can develop characters and themes and plot along the way whereas in a short story it all has to be done in a few sentences, or words even. A short story is way easier to finish though. You’ve chosen a very challenging subject. What made you decide to write Anna’s story? Is she based on a real person? She is not based on a real person but some of the events I’ve written about have certainly happened to people. The situation and conditions in the camps are real but the characters and the way they interact in the novel are imaginary. I’ve been interested in those stories of survival since I was a teenager for some reason and have read some historical accounts. Many survivors keep their stories to themselves till they are much older, and some things probably go with them to the grave. I have often wondered what it would be like to survive, come back to a ‘normal’ life and how your mind would deal with it. One of the most dramatic events in the book occurs in New Zealand, late in Anna’s life. This is based on an actual happening that occurred not far from here. It set me thinking… why would anybody do that? That’s really where the story came from – I started to fill in the gaps. Do you have a regular writing routine? How do you juggle writing with your work as a GP? Well, kind of. I have a regular bit of time off in the week when I write. Sometimes I spend most of it staring at the blank screen. You held an NZSA mentorship while you were writing No Second Chance. How do you think that helped you? It helped me a lot, basically by getting a lot of feedback on the text and how I was writing, seeing the recurring faults in my writing. I realised I had still a lot of work to do on the manuscript even though I thought it was already well drafted. I learnt a great deal. My mentor was encouraging while being honest about the bad bits, and there always are bad bits. She also praised the good bits, which I enjoyed more, strangely enough. What are your writing plans now? Will you stick to novels? At the moment I’m sticking to novels. I’ve written a draft of another one, possibly a second draft. It’s very different, though also historical, this one is set in sixteenth century Aotearoa before European contact and has a teenage boy as protagonist. Finally, do you have any advice for first-time novellists? I tend to think a lot and write little. I advise them to do the opposite. No Second Chance can be bought from Steele Roberts and Unity Books, or any bookseller will order it for you if you ask.